More than fans of horror and all things spooky, we are David and Stephanie Mucci. My wife, Stephanie, is a licensed embalmer and funeral director. She has a passion for the death care industry and has worked in the field for over 18 years. When I’m not thinking up some hair-brained business idea, I’m a fine arts oil painter. From classic realism to modern, I work part time selling commissioned pieces. We have always been involved in the business of all things spooky and entertaining. One of our past endeavors was Spookadar. First the website, then the hugely popular brick and mortar location in Modesto, CA. 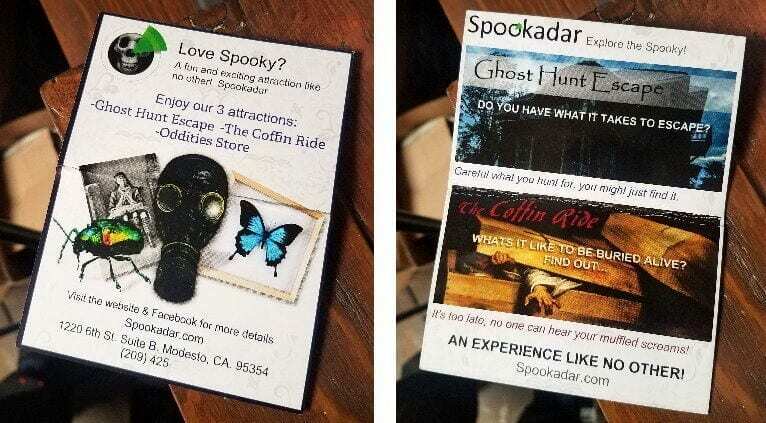 It consisted of our Ghost Hunt Escape Room, Oddity Store, and Coffin Ride. I can honestly say this was a business like no other, one that Stephanie and I absolutely loved. Now, with great excitement, we bring you Grants Pass Basement! What is Grants Pass Basement? It’s an Oddity Store in Grants Pass, Oregon. And… it’s in the basement of our home. It’s not a retail store, it’s a place you can purchase and view our collection of Oddities and Curiosities. You can even experience our Coffin Ride. (Yes, the coffin ride is here too) We will gladly set an appointment for you to come check it out. Message us on Facebook. Or Contact us via this site. This site, OdditiesForSale.com is our Oddities Website and features just a few of the items we have available. When you purchase we’ll ship immediately. Locals can purchase and pick-up at their convenience. We are excited to be able to share our passion for all things unique, spooky and curious. We’re growing fast and look forward to offering more entertainment and spookiness to the Grants Pass area.